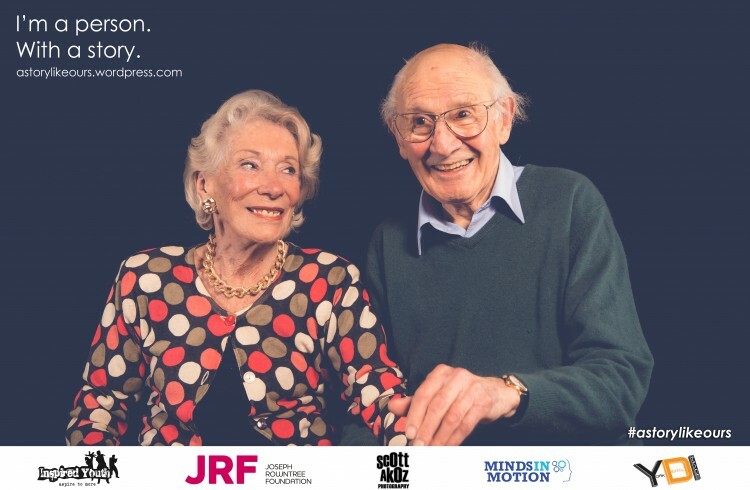 An Inspired Youth media and film campaign commissioned by JRF is set to launch a public exhibition during National Dementia Awareness week. The exhibition, which features positive portraits featuring people living with dementia and their families and Carers, will be showcased at City Of York Council’s West Offices from 18th to 22nd May, before a public exhibition at Kings Manor on Saturday the 23rd May between 1-4pm. The work aims to contribute to the already excellent work being done in York to raise awareness of dementia, challenge attitudes and reduce stigma. The campaign includes a range of media including films, a people focused exhibition, life stories and a series of posters. The work, created in partnership with Harmony Café and JRF aims to present positive portraits of people living with dementia with a focus on characters and relationships. The striking photographs, shot for Inspired Youth by Scott Akoz photography, were taken over several months working in partnership with Minds In Motion, a student charity that runs ‘Harmony Café’ in Tang Hall. It is an amazing monthly event for people living with dementia (run entirely by a group of dedicated students) and is regularly attended by up to 100 people. Two films also produced as part of the campaign will be screened before feature films at York City Screen Picture House during Dementia Awareness Week. Following the public exhibitions, the work will be available to local organisations and businesses who may wish to display them. If you would like to host the exhibition you can contact Joseph Rowntree Foundation direct.